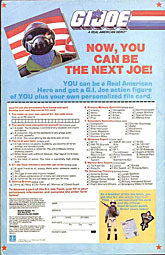 Back in 1987, Hasbro was riding high on the success of GI Joe, and decided to give its fans a treat: the opportunity to become a real member of the GI Joe team (unlike our offer to become a fake member). You filled out a form, sent in your check, and 6-8 weeks later, you got your own Joe in the mail, a member of the Steel Brigade. They were a great addition to the ranks of GI Joe, with a cool design that finally introduced a generic good guy - this was well before we had any "greenshirts." The Steel Brigade promotion ran until 1994, so over the years, there were a lot of Steel Brigade troopers made. In 2006, Hasbro released a few more. Rook specializes in the art of lie detection without the use of polygraph machines, computer voice stress analysis, or truth serum. Instead, he observes the subtle differences in the timing and duration of emotional gestures, expressions, and words. These differences will instantly reveal to Rook if his contact is lying. Now take this skill and multiply it by the 14 different languages that Rook is proficient in, add the fact that he does 90% of his work in dark alleys, secret rooms, and rooftops, and you begin to get a picture of why General Abernathy was so interested in recruiting him for the GI Joe team. Imposing and powerful, Checkpoint is the only man to ever best Major Barrage on a wrestling mat. Back in college they attended rival schools, and a mutual respect/resentment relationship was born. It was rumored that Major Barrage blew out a knee during a wrestling match with Checkpoint, forcing Major Barrage to miss the Olympic tryouts. Needless to say, when these two behemoths pass each other in the halls, you can cut the tension with a chainsaw. It's a good thing that Checkpoint is an excellent carpenter because he spends most of his downtime fixing the walls that he and Major Barrage bust up when their egos collide. Anyway, Checkpoint and Rook share the same body, which is why we're listing them both together here. The majority of the bodies (ie, the legs, crotch and arms) come from the G2 SpyTroops Grunt, while the chest was originally seen with Salvo, the only guy who can make Flash look cool. The look is fairly plain, suiting military men: black boots, khaki pants and a blue t-shirt. This actually looks like something a soldier would wear - as opposed to, say, Quick Kick - and by extension, even makes Spirit's get-up look (slightly) less outlandish. Both figures get unique head sculpts, which definitely isn't something you could ever say about the original Steel Bridage troopers. Thing is, it's kind of hard to tell who's who - one guy has short, kind of curly hair, while the other's is straight. On the filecards, Rook is depicted with straight hair, while Checkpoint seems to have a Caesar cut. Simple enough, right? Well, it might have been, except that the cards show Rook with dark brown hair, and Checkpoint with light brown; but the figures reverse it, so the straight hair (dark on the card) is light on the figure. Confused yet? The best analysis is that the toy with the light, straight hair is Checkpoint: he's supposed to be a fairly large guy, and though the two figures' bodies are the same, that head is noticably larger than the one with the dark, short hair. The drawings of the characters faces on the filecards also seems to support that, for what it's worth. But if it's all too much for you, there is an easy workaround: never look at their faces. Yes, to help complete the full "Steel Brigade look," both figures have removable vests and helmets, which are entirely new molds. The full ensemble makes the modern take on the Steel Brigade look like a relative of the Future Force Warrior program, giving the Steel Brigade a military grounding the G1 version admittedly lacked. The vests are heavy tactical numbers, with lots of padding and a single piece of armor on the shoulder, while the helmets cover the entire head. Even the accessories are nice. Checkpoint has a huge two-piece missile launcher with a red missile, and a police baton; fitting, since his filecard lists him as an MP. 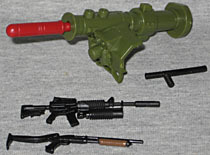 Rook gets a shotgun with an unfolded stock, and an M-4 machine gun. The M-4 is a really spectacular piece, in that it can be disassembled into four pieces: the main body, the stock, a silencer and a grenade launcher. Damn! What won Best Accessory in the '06 ToY Awards? Billy the Puppet? Oh, okay, that probably still would have won, but this is still an excellent accessory. Re-release it, Hasbro, so it can have another shot at the title! 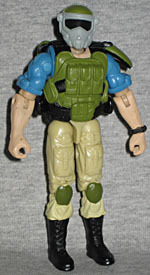 The GI Joe team took an interest in Red Zone when they learned he was considered "a little too enthusiastic" for the FBI. That means he often pounded the sense out of bad guys while catching them and usually left large holes in enemy installations. That also means he's the perfect guy to fight his way through a legion of Cobra Viper troops and Cobra B.A.T. forces to help his teammates out. When everything is on the line, Red Zone is usually the guy with a grenade launcher in one hand, a rifle in the other, and the shattered splinters of a big, thick door at his feet. Red Zone is an interesting figure, and not just because he doesn't share his mold with the other two Steel Brigade troopers in this set - instead, everything below his neck comes from a G2 Gung Ho. He still has the green, black and khaki color scheme as his fellows, but he's obviously not dressed the same. He's ripped the sleeves off his shirt for some reason, and his pants aren't tucked into his boots. Overall, the guy definitely looks tough. Though Red Zone doesn't get one of those nifty vests, he does have one of the SB helmets. However, that doesn't mean you'll want him wearing it all the time: see, the figure's face is based on a real guy: Joe fan Luke Ellison won a 2004 contest in FHM, was flown up to Rhode Island and laser scanned at Hasbro's headquarters, and the rest is history. Since we have a real person to compare to, it's easy to see that the likeness is just as good here as it is on any Star Wars figure - Hasbro really knows how to make a 3¾" figure, don't they? Luke Red Zone's accessories include the same shotgun Rook carries, a huge revolver and small pistol that originally came with G2 Beachhead. 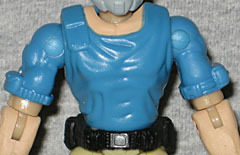 On his left leg is a holster, which can be used for either handgun - though it seems designed for the pistol. The flap is soft enough that it can be folded down, but it's molded sticking straight up in the air, and there's nothing to hold it down if you do fold it over. Now, there's more to this set than the three Steel Brigade boys: this was one of Hasbro's big six-packs, so we get three Cobra Plague Troopers as well. Machine gunners provide suppressing fire on an opposing force's position. This forces the enemy to take cover, which either halts an oncoming offensive or allows friendly forces to move onto the field with less danger. To achieve this goal, Destro designed the Cobra SAW Viper program for the Cobra organization. The Cobra SAW Viper troops are not expected to be precise. Their objective is to throw as much lead down range as possible and let the other troops worry about the rest. Whenever a particular Cobra SAW Viper fired with precision and rapidity, his squad leaders recommended him for transfer to the elite Plague Trooper force. Gallows was one of the first to be recognized as the best machine gunner, and was issued his code name by the force's leader, Guillotine. Plague Trooper forces are the very best of the very worst, hand-selected by Cobra Commander from the various Cobra ranks. While the standard soldiers rarely interact with the Plague Trooper forces, the reputation of Grim Skull is legendary throughout the ranks. He was a Sand Viper trooper whose unit was tasked with retrieving live mutation samples from a remote research facility in the Central African desert. The lab personnel escaped with their test subjects, but Grim Skull improvised and successfully returned to Cobra Commander with live samples, after he had altered the genetic structure of his own team using materials left behind in the lab. Impressed with his ruthlessness, Cobra Commander immediately signed orders to transfer Grim Skull to the Plague Trooper force. Like Checkpoint and Rook, Gallows and Grim Skull are two of the same figure, but in their case, there's at least a bit of superficial difference - about a quarter ounce of paint. 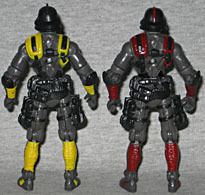 They both wear grey bodysuits, but Gallows gets red highlights, while Grim Skull is accented in yellow. Looking at the level of detail found on the bodies (as well as all the articulation), it probably won't surprise you that this particular mold orginated with a G2 Snake-Eyes. It works better here than on a supposedly stealthy ninja, though. Both guys share new, similar head sculpts. The helmet has a very "Darth Vader" look to it, with a triangular grille over the mouth, soul-less eyes, and a helmet with a flare over the base of the neck. Gallows' helmet has a smooth crest, while Grimmy has a row of spikes. Plus, there's paint over Gallows' right eye, and over Grim Skull's left - yet another way the two are separated. It's a creepy look, but isn't that what they'd be going for? A heavy machine gunner, Gallows logically comes with a bigass machine gun. It's the kind of thing Roadblock would carry, going so far as to require a carrying strap. He's also got a knife, though it's obvious that's not his main weapon. Grim Skull get a giant rifle that seems to fire rockets, if the ammo sticking out the bottom is any indication. He also gets a small, normal-looking submachine gun. It takes a truly sinister individual to lead the Plague Trooper forces, and Guillotine is just the person for the job. A former US Navy SEAL who became frustrated with the lack of ruthlessness that his fellow SEALs displayed, he joined the Cobra organization and became a Cobra Eel, enduring the grueling aquatic training and jungle warfare schol. He quickly rose to a leadership post by breaking the will of anyone who stood in his way. He is qualified to lead any Cobra detachment and can suffer environmental extremes that leave most of his peers begging for relief. It's rumored that Guillotine was hand-selected by Cobra Commander to design the training program for the Plague Trooper force. He now leads this new force with a fervor that rivals that of Cobra Commander himself. Just as Red Zone got a unique sculpt for this set, so does Guillotine. He's a big, bulky guy, and his sleeveless uniform shows off the muscled arms. The suit is much sleeker than the other two Plague Troopers', so it really does look like something a former SEAL would choose to wear. There's no mistaking that this guy is a badass! Guillotine has a bald head, and wears a big mustache and a soul patch. He definitely looks threatening, buthe also looks like he's trying to impersonate Gung Ho or Dr. Mindbender. If that throws you off, you can give him his removable helmet - although the filecard says he used to be an Eel, the helmet really reminds me of the Moray. Sorry, make that Hydro-Viper. Just without the eye-stabbing magenta. Two tubes from the mask trail down and plug into the figure's backpack, which is particularly odd, since it certainly doesn't look like there's an air supply inside. Oh well. He's also armed with a huge black rifle, and a sword that would do the Predator proud: the pommel and hilt are a human skull and spinal column. The jagged silver blade can store (loosely) in a slot on the side of the backpack. I only bought this set because I wanted the Steel Brigade figures: in fact, I even tried to trade away the Plague Troopers, but now I'm glad I didn't. 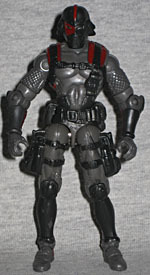 Both halves of this set are good, and bring a little spice to the GI Joe universe. All these characters were created specifically for this set, proving that Hasbro doesn't need to stick to the old characters in order to make good toys.